Les Terraces at 2250 Bellevue Avenue is an 11 unit complex in Dundarave on the Oceans Edge, steps from the West Vancouver Seawall. These Apartments feature fantastic views of the ocean, harbour, Vancouver, and the North Shore oceanfront and skyline. Restaurants, schools, shopping, transportation, West Vancouver recreation Center, West Vancouver Library, and marinas nearby. 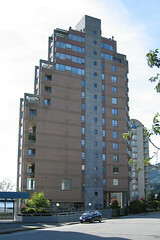 Exclusive 1 home per floor in this prestigious West Vancouver Apartment.